Awareness of new lands and advances in shipbuilding and navigation led to an increase in ocean travel. Communication, however, did not advance allow for notification of weather and other dangers. Shipwrecks resulting from human error, meteorological events, and other dangers often resulted in the loss of ships. Over one hundred years after the publication of Robinson Crusoe, stories about shipwrecks were still popular among the English public. This account, significant for relating the shipwreck from a woman’s perspective, tells the story of how the ship Francis Mary became stranded at sea due to a storm. Unlike the utopian fiction of Crusoe, the crew and passengers of the Francis Mary ultimately resorted to cannibalism to save themselves from starvation. Saunders’s account of these grisly events focused on her spiritual turmoil and the importance of her Christian values. 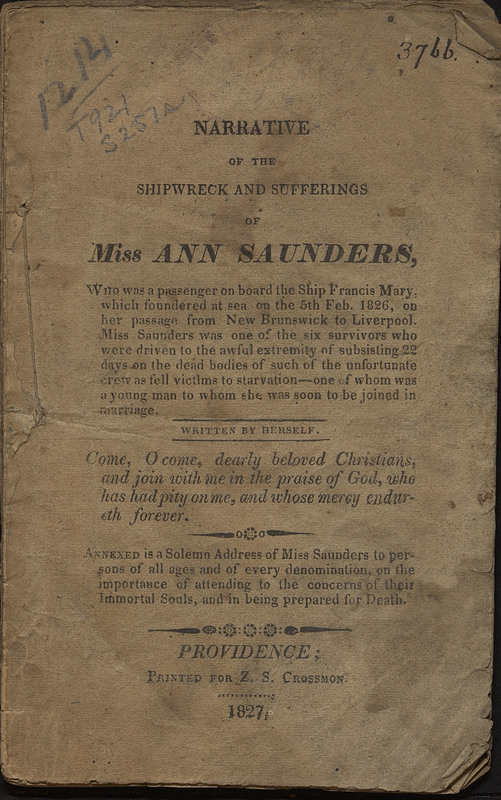 Narrative of the Shipwreck and Sufferings of Miss Ann Saunders: Who was a Passenger on Board the Ship Francis Mary, Which Foundered at Sea on the 5th Feb. 1826 on Her Passage from New Brunswick to Liverpool. Providence: Z.S. Crossmon, 1827.